America, A Question: What Do You Want? New McCain Ad, "Celeb"...Ready to Laugh, Yet? The new ad out by McCain called, "Celeb", attaches Barack Obama to the likes of Paris Hilton and Britney Spears? The whole premise of the McCain Campaign is to go negative, hard on Barack Obama. Make Barack Obama unacceptable, not ready, put the doubt in your mind, and have voters fall back to the old comfy shoe, John McCain. This tactic is about running against Obama's popularity and making this the main issue, instead of McCain talking about his vision and his policy. Can it work? Yes, but what makes me doubt this is the new CNN/Poll out today. Barack Obama cracked the 50% mark. Obama 51, McCain 44. The metrics are here. The Obama Campaign came out with a new ad, called "Low Blow". This is a good ad and frankly, I expect more of this and harder. Fight McCain on his lies and his dismal record. That is winnable. The Britney/Paris ad above, useless in my view. Remember this, Obama will get a bump in the polls for his VP pick, after the convention and the debates. The debates he must nail McCain to the wall and he will. Lastly, when the debates come around, we will see a stark difference on that stage. Change vs. More of the Same. Future vs. The Past. Young vs. Old. New Direction vs. the Same Old Road. Obama will win this point, too. Obama then turns this around to ask why is McCain so fixated on me? “He’s spending an awful lot of time talking about me,” Obama told a crowd of 1,200. “I haven’t seen an ad yet where he talks about what he’s going to do. And the reason is because those folks know they don’t have any good answers. They know they’ve had their turn over the last eight years and made a mess of things... And so the only way they figure that they're going to win the election is if they make you scared of me. So what they’re saying is, 'Well we know we’re not very good, but you can’t risk electing Obama. You know, he’s new. He doesn’t look like the other presidents on the currency.'" Those 75,000 Democrats who will pack a football stadium for Barack Obama's convention speech won't be there just to whoop and holler on television. They'll form the world's largest phone bank to boost voter registration — fired-up supporters using computer targeting the campaign has spent months putting together. The move to the Invesco Field at Mile High stadium for the convention's final night next month — at an additional cost of $5 million — will capture a huge crowd the Obama campaign plans to put to work. They'll be armed with data gleaned through "microtargeting" unregistered voters the campaign believes are ripe to back Obama if pressed to get on board. 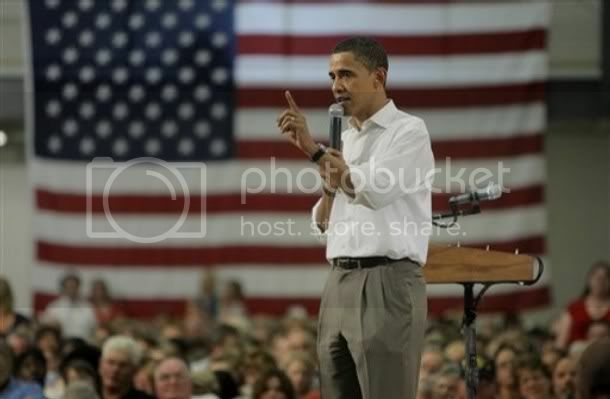 and Obama Missouri Pictures, here. Senator Obama has to walk a fine line with respect to his demeanor. I think he is exuding an eloquence that has been missing in our political landscape for far too long. G.W. Bush degraded our nation's image so much that Obama HAS to energize not only the national constituency but the world as well. With all of the issues of importance to the nation he must give an appearance of confidence but not seem too "arrogant", as the right wing pundits like to say. So, president Obama's challenges are great but he has the intellect, academic acumen and youthful exuberance to take these issues on. Let's be real. Anyone running for POTUS is arrogant, they believe in that they can be the best and effective Commander In Chief. Barack is walking a very fine line, woven by him, and he is doing well. But, we must not let untrue ads go and just think the public will get it. If the public really, "got it", George W. Bush would not be president, today.